Laddoo is one of my favorite people in India. He is a barber that has been cutting my wife’s family’s hair for three generations now. 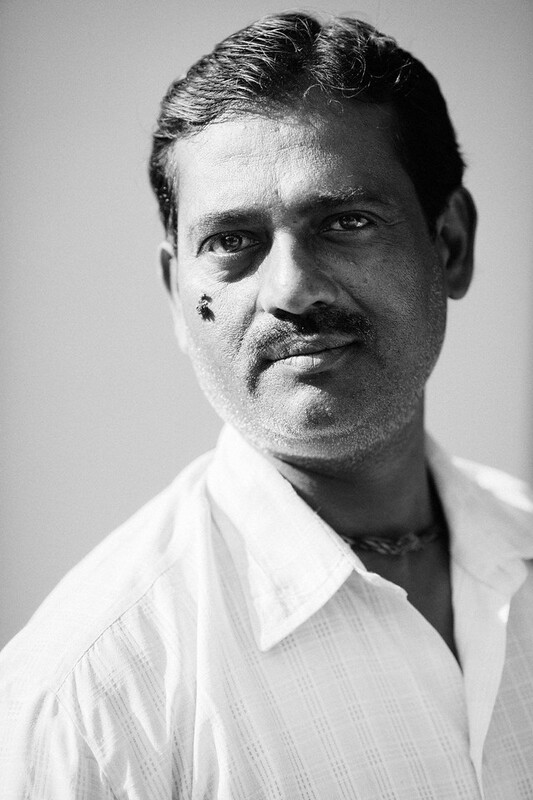 I met him during my first trip to India and have seen him on every visit since. He always comes over to the house and gives me a fresh cut, shave and massage. It is traditional for barbers in India give really great head and shoulder massages after cutting your hair. Laddoo even cracks my neck as part of the massage, which is kind of scary, but it has always made my sore neck feel better. On our latest trip to India I asked Laddoo to pose for a portrait since he is a very important person to me in my wife’s hometown of Hazaribagh. 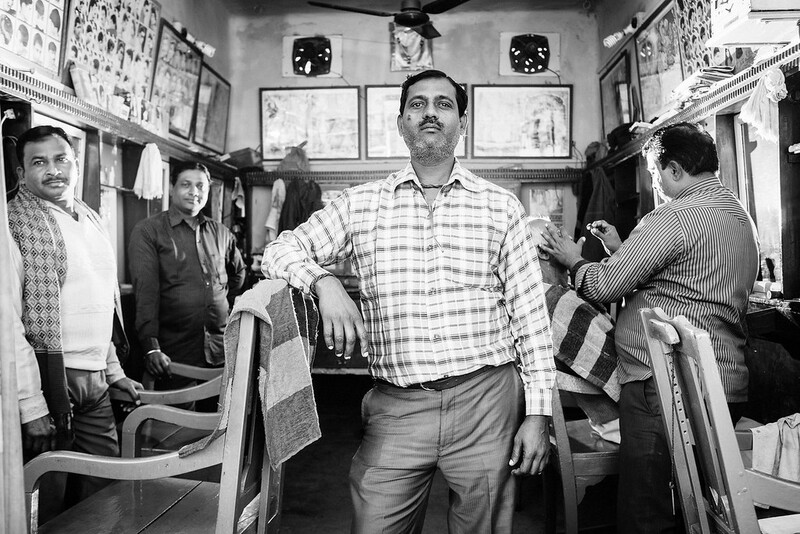 I also made a surprise visit to see his barber shop and made a portrait of him and his brothers in their space. Of course Laddoo being so generous, he had to give me another trim and massage (I think there is some footage on instagram if you follow @pjbellinger). Before leaving Hazaribagh I had several prints made of all the different people I made portraits of, and I delivered them to each one in person. There is something special about giving and receiving prints. Prints create a connection that is missing when you only deliver electronic files. In this case it was a nice way to say thank you and farewell until next time. These are the photos that make all of the hard work worth it. They are special photos that can happen in the blink of an eye if you are on your game. For the portrait of Laddoo by himself, he posed for less than two minutes before he was on his way. I scoped out the white wall on previous days and knew it would be lit up nicely in the afternoon sunlight. I put Laddoo in direct sunlight coming from camera left. Since half of his face is in shadows, we call this split lighting, which I really like because of the contrast. The whole front of the house and driveway were lit up with sunlight in front of Laddoo to create nice catchlights in his eyes. The portrait of Laddoo and his brothers was created during a bright sunny day with a single speedlight held by my little sister in the back of the shop to create rim light, or backlight on the subjects. Because the speedlight is all the way in the back of the room it has the effect of lighting the whole room. It’s a lighting technique that is somewhat overused but is a fast and convenient way to add a bit of drama to an otherwise natural light environmental portrait. I am portrait photographer Paul Bellinger, and I have an unmatched passion for the art of portraiture. I have put many years into the study of everything about portraiture, from the timeless classics by the great masters of generations past, to the leading portrait artists of today. My hard work and dedication has paid off and my portraits are increasingly being sought after for magazine covers and editorial features, and I have on set experience with large-scale fashion, celebrity and sports photo shoots. I specialize in dramatic studio portraits of individuals from headshots and professional business portraits, to fashion and glamour.